I stayed in a jungle paradise recently. Every morning I woke up to the sound of toucans and howler monkeys hanging out in the tropical hardwoods around my simple cabin. If you’ve never heard them, toucans have a sort of high-pitched call that’s a cross between a whistle and a laugh. Howlers…well, they issue a guttural roar much too loud than should be coming from such a small monkey. The howlers were drawn by the abundant fruit trees on the property and surrounding jungle: citrus, water apple, and a type of passion fruit. Traveling in groups they’re easily spotted—watch for shaking trees as they leap from branch to branch. But the toucans proved more elusive until one morning I rushed to the back yard and spotted three aracaris (a variety of toucan of black, red, and yellow plumage) on a palm tree. 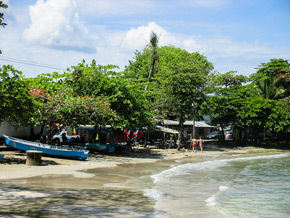 As International Living‘s Costa Rica Editor, I’ve crisscrossed this little Central American gem. But when I got to Puerto Viejo de Talamanca on the country’s Caribbean coast, it almost felt as if I’d crossed an invisible border into a different country. The landscape was different. The jungle seemed to be everywhere, an impenetrable green wall except where a bit had been carved out for homes, villages, or farm fields. It was full of wildlife. There were other factors. The music coming out of car stereos had changed from the Latin favorites cumbia and bachata to the sultry rhythms of roots reggae. And you’re just as likely to hear English (with an accent reminiscent of Jamaica) spoken as Spanish when you speak to the area’s residents. There are no big resorts, no hotel or condo towers, no large-scale development, and no gated communities. There’s a DIY, self-sufficient feel to the place. 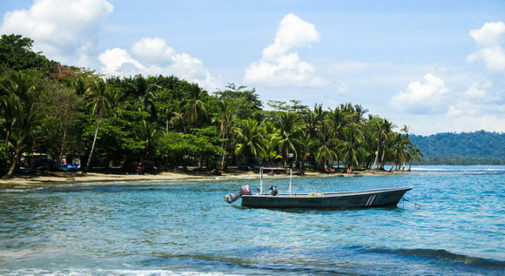 In Puerto Viejo de Talamanca, the people live la Pura Vida—a stress-free, family-orientated life. Life is simpler here. In a laidback country—this is the land of Pura Vida (“Pure Life”), after all—this might be the most laidback area. Things run at the speed of a bicycle, the preferred mode of transportation. There’s no stress, no rushing around, no hassles. And forget about dressing to impress. The uniform is flip-flops, t-shirt or tank top, and shorts. Most businesses are mom-and-pop operations, either run by locals or enterprising expats. Some have revived the local cacao industry on a small-scale, with tiny plantations in the jungle that they harvest by hand and turn the beans into chocolate in small on-site workshops. You also have yoga studios, grocery stores carrying gourmet and imported items, and restaurants—everything from organic vegetarian to Argentinian to sushi to Israeli. You see, expats from dozens of countries live here. Fortunately, many of them love to cook and have decided to share their cuisine with their new neighbors. The local food is great too—and quite unlike that of the typical dishes you find in the rest of Costa Rica. The Central American staple of rice and beans is cooked in coconut milk and a blend of spices in this location, plated with a piece of chicken prepared the same way. That will cost you a massive $5. A savory coconut-based seafood soup is another favorite. And fresh fish, like pargo (snapper) and dorado (mahi-mahi), is abundant thanks to the fishermen who head out each day all along the coast in open boats called pangas. You’ll pay $4 a pound for fresh catch if you want to fire up the grill at home. A narrow two-lane road hugs the coast—one of the few paved routes. It runs through the forest, sometimes coming within a few feet of the beach. It’s golden sand, with plenty of overhanging palms to provide relief from the tropical sun. The azure waters help you cool off, too. My simple cabin (no TV—not that you’d want one here—but reliable high-speed internet) was just a five-minute walk from the beach. You’d think in the jungle that the atmosphere would be unrelentingly hot and humid. But many, if not most, homes here are open air, some with no windows. It’s the way people live. During my recent stay the temperatures were pleasant, even in the hottest part of the day. The sea breezes helped for sure…as does being in the shade of the trees. You can rent from $500 per month—that’ll get you a two-bedroom, furnished home in the jungle with plenty of creature comforts. There’s a real sense of community. On my last weekend, I headed to the Saturday morning farmers market. Locals and expats shopped for produce side by side, children ran into the arms of family friends and were hoisted into the air to delighted shrieks, and couples chatted about their plans for that night. It was a place where people bonded over food and fellowship…and politics and gossip were never even considered part of the conversation.